Mobile 5G isn’t here yet. And no matter how fast or shiny the best phones available today are, they’re going to feel somewhat lacking once 5G networks finally start going live. But what if you could add 5G support to a phone months or even years after you bought it? That’s exactly what Moto is planning to do with the new Z3, because by leveraging the power of the company’s modular add-on system, the Z3 is being billed at the first 5G phone—if you combine it with an upcoming Moto Mod featuring a built-in 5G modem. Motorola says that big lip on the top of the 5G mod is there to accommodate extra antennas for better 5G reception. It’s a bold idea. Not only does it give Motorola the flexibility to upgrade the Z3 post-launch, it also capitalizes on what made the whole idea of smartphone modularity so tantalizing the first place. Compared to previous mods like the Moto Gamepad and Moto Stereo Speaker—which often felt superfluous—the Moto 5G mod would in theory have the power to change your phone in a much more meaningful way. While Motorola hasn’t announced a price or release date for its 5G mod yet, it said it will use Qualcomm x50 and x24 modems to deliver speeds potentially in excess of three gigabits per second (or five gbps when tethered to a PC), while also sporting a built-in 2,000 mAh battery to alleviate concerns about that 5G connection burning through your battery. In keeping with the spirit of modularity, Moto says its 5G mod will be compatible with all of Motorola’s previously released Z phones by 2019, likely before a robust, mobile 5G service from Verizon is actually widely available. As for the phone itself, the Z3 looks a lot like the Z3 Play that came out earlier this spring, but with slightly beefier, though not quite flagship-level components. It has a Qualcomm Snapdragon 835 processor, 4GB of RAM, 64GB of storage, a microSD card slot, dual 12-MP rear cameras, and a 6-inch 2160 x 1080 AMOLED display. The Z3 even retains the side-mounted fingerprint sensor found on the Z3 Play. On the bright side, with a retail price of just $480, it’s significantly cheaper than most premium devices. 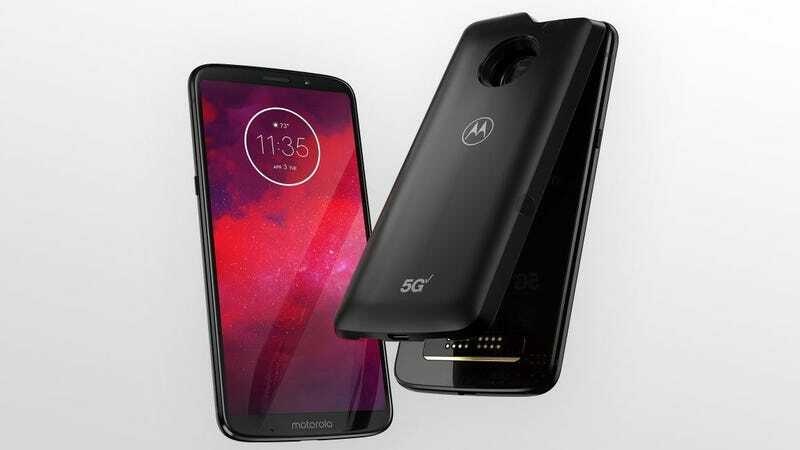 However, one big caveat to all this is that both the Z3 and Moto’s 5G mod will be available exclusively on Verizon, so your 5G hopes and dreams will be tied to whenever Big Red flips the switch on its network. Additionally, people will need to think about 5G coverage in their specific area, because when 5G becomes available, it will be on a city-by-city basis instead of an instantaneous, nationwide roll-out. You may also want to consider how upgrading your phone plan to 5G might actually work. Regardless, with at least one device already claiming to support “the next big thing” via a neat new add-on, it’s clear the race to 5G hardware is starting to heat up. The Z3 will available on August 16, though it’s anyone guess as to when the 5G Moto Mod will be ready for an official release. Did Amazon Just Accidentally Confirm Samsung’s Unreleased Dual-Wireless Charger?